Air Force Staff Sgt. David "Sham" Wieger, 28, of North Huntingdon, Pennsylvania, a special agent for the Air Force of Special Investigations, Detachment 303, Travis Air Force Base, California, died Nov. 1, 2007, near Balad Air Base, Iraq, of wounds sustained from an improvised explosive device that struck his vehicle. Wieger is survived by his wife, Brenda; parents, Michael and Loreene; brother, Michael; and many aunts, uncles and cousins. Special Agent Nathan "Ned" Schuldheiss, 27, of Newport, Rhode Island, a civilian assigned to the Air Force Office of Special Investigations, Detachment 204 Offutt Air Force Base, Nebraska, died Nov. 1, 2007 near Balad Air Base, Iraq, of wounds sustained from an improvised-explosive device that struck his vehicle. Schuldheiss is survived by his father, retired Lt. Col. Jeff Schuldheiss; mother, Sarah Conlan; stepfather, Kris Mills; and sister, Erin Dreeszen. CrossFit Level 1 Certificate Courses: Iron Major CrossFit, CrossFit Vitality, NorCal CrossFit Santa Clara, CrossFit Boston, CrossFit Verve, CrossFit Morristown, I Am CrossFit Coconut Grove, Reebok CrossFit Officine, CrossFit Original Addicts, CrossFit Da Vinci, CrossFit Vienna the Dungeon, CrossFit Sentinel IFC, CrossFit 9 Dragons, CrossFit Jozi, CrossFit 1810, Camp Arifjan, Kuwait. CrossFit Level 2 Certificate Courses: Reebok CrossFit One, Trident CrossFit, CrossFit Effects (FX), CrossFit Jotun. CrossFit Kids Courses: CrossFit EaDo, CrossFit South Side. "The Not-So-Sweet Relief: How The Soda Industry Is Influencing Medical Organizations" by Richard Bruno and Kevin Burns, The Equation. In the remaining time, perform max rep of burpees over the barbell. Post the number of Burpees Completed. CrossFit Level 1 Certificate Courses: CrossFit High Performance, CrossFit Ranch, CrossFit Carbon, CrossFit North Atlanta, CrossFit Mayhem, CrossFit SoCal, CrossFit Hampton Roads, CrossFit EaDo, University of Nevada CrossFit, CrossFit New West, Reebok CrossFit 33100, Reebok CrossFit Parma, CrossFit Original Addicts, CrossFit Modiin, CrossFit Life Performance, CrossFit Sentinel Avenue, CrossFit Jozi, Punk CrossFit, CrossFit 1810. CrossFit Level 2 Certificate Courses: Atlas CrossFit, Peak 360 CrossFit, Reebok CrossFit Plaza Condesa, Reebok CrossFit 3D, Southern CrossFit, CrossFit Chiwoo. 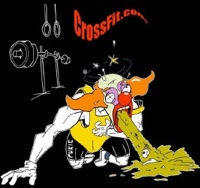 CrossFit Competitor's Course: CrossFit FRA, CrossFit STHLM (Stockholm). CrossFit Kids Course: CrossFit Rocks. Ben Smith, Team Series Event 12. Andrew Gray, Team Series Event 12. CrossFit Level 1 Certificate Courses: CrossFit Reston, CrossFit King of Prussia, CrossFit X-Factor, CrossFit Strong, CrossFit SS (South Side), Reebok CrossFit One, CrossFit Columbus, CrossFit Da Vinci, Reebok CrossFit Louvre, Reebok CrossFit FSF, CrossFit Richmond, Reebok CrossFit LifeSpark, CrossFit Herzliya, Innervate CrossFit, Reebok CrossFit Sentinel Downtown, CrossFit Cidade Jardim, Fuerza CrossFit, Reebok CrossFit PTY. CrossFit Level 2 Certificate Courses: CrossFit Atlanta, CrossFit Max Effort, CrossFit Chiwoo. CrossFit Competitor's Course: CrossFit Thames. CrossFit Kids Courses: CrossFit Brand X, CrossFit Verve. 2009: California State Sen. Ron Calderon (D) presents SB 374. It would impose state requirements for personal trainers, as promoted by the ACSM. The bill does not pass. 2014: A federal grand jury indicts Sen. Calderon for accepting $88,000 in bribes. His trial is scheduled for May 19, 2015. Week 3 CrossFit Team Series events announced. Irakli and Lola, CrossFit Tel Aviv. "How School Lunch Became the Latest Political Battleground" by Nicholas Confessore, The New York Times. Women's shows of the 2014 Reebok CrossFit Games air on ESPN from 5-8 p.m. PT. 60 sec calories on rower. CrossFit Level 1 Certificate Courses: Rainier CrossFit, CrossFit Lackland, CrossFit Fury, CrossFit Ethos, CrossFit Park City, Sandia CrossFit, CrossFit Colosseum, CrossFit Bold, CrossFit 2725, Reebok CrossFit Velocity, CrossFit ALC, CrossFit Rocks, Reebok CrossFit Sentinel Downtown, Reebok CrossFit Heart and Beauty, CrossFit Bogota, CrossFit Posto 9. CrossFit Level 2 Certificate Courses: CrossFit Vitality, CrossFit Reston, CrossFit Richmond.